Closely followed by "I wonder when this will come into play?" And as a final thought "Hang on a minute. This is actually pretty scary stuff." But, any idea thought up by Elon Musk must be foolproof right? He's the creator of PayPal, the boss at Tesla, the 'Rocket Man'. Surely this will be safe solution to solve an age old problem that is TRAFFIC. Some of you may be thinking this is a bit far fetched but remember, this is the guy that came up with the far fetched idea of landing a space rocket. He nailed that! Anyway, I'd definitely give this a go to end my daily commute. Would you? What did we learn from Elon Musk's big reveal? 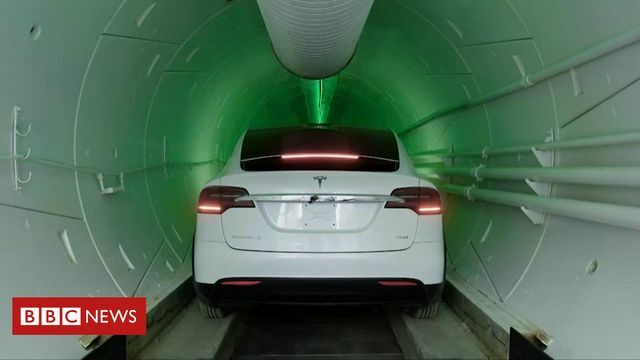 Exit player Video Elon Musk launches high-speed underground tunnel Elon Musk has unveiled a prototype underground tunnel in Los Angeles designed to transport cars, at high speed, around the city. The goal is a network of tunnels to alleviate chronic traffic congestion.